The Black Bear Diner in Chubbuck, which opened earlier this year. Looks like work has finally started on converting the Rusio’s building at 1610 E. 17th Street to a Black Bear Diner. In addition to the chain link fence around the work site, city records show a commercial remodel permit, applied for Aug. 12, was issued on Tuesday. The general contractor on the 458,104 square-foot project is Bateman Hall. There is no set date for an opening yet. The space has been vacant since Rusio’s closed in 2015, but developer Shane Murphy of Venture One Properties announced in May he had lined up Black Bear, a company based in Redding, Calif., which already has a restaurant in Chubbuck. The chain dates back to 1994 in Mount Shasta, Calif., when it was founded by Bob and Laurie Manley with help from Bruce Dean. The franchise has grown to more than 76 locations in eight western states, including two in Idaho, in Boise and Chubbuck. Black Bear Diner was recognized in 2015 by Franchise Times as one of the smartest growing brands. Black Bear features a rustic motif with "over-the-top bear paraphernalia". 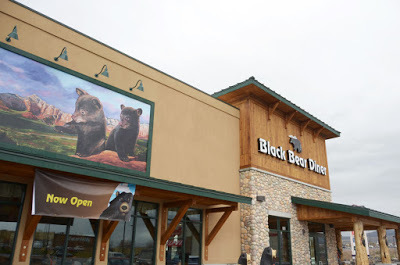 Every restaurant is decorated with a 12-foot-tall black bear carving by artist Ray Schulz. Additional murals and artwork are created for each restaurant by Steve and Gary Fitzgerald and Colleen Mitchell-Veyna. The menu format mimics an old newspaper titled, “The Black Bear Gazette,” with articles on the front page. It offers family meals such as breakfast, burgers, salads, and shakes. Pies, bread and cobblers are prepared on site. For a full menu and additional information, visit blackbeardiner.com.